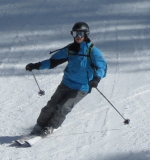 I'm a intermediate-high intermediate northeast skier. Stand at 5' 5"+ , weigh 170lbs and in somewhat good shape at age 46. Got a pair of 164mm Smoke Ti coming and am a little concerned with going too long. The skis would come up to the upper part of my forehead, but plan to use them on light/med powder and crud conditions. My other skis are 160mm Atomic SX-11(still having fun on them) which are used mainly on hard groomed/ice conditions. Did I go too long with the 164mm Smoke Ti? Demoing is ideal, but not practical for me as I average about 5-6 ski days a year and on a budget. BTW, the Atomics are replacing a pair of 169mm X-scream series which are okay in soft snow, but would like something wider underfoot. I think that nose high for groomed trails to head high for softer snow is about right. So I think you will be fine. What Jim said . They should be fine. I hope you enjoy them. Let us know how they work for you. Yup...that little longer ski is going to pay dividends smoothing out the curd and broken snow! Would love to here your on snow review of that ski...looks like a good one. Okay, skis arrived and are still packaged. However, I now see an available pair of the 2011 Blackeye Ti in a 160mm for a nice sale price. It's a $100 difference , but I like the all wood core and green color. Jim...I actually like the difference in what's underfoot with the Blackeye TI....I think it just gives you better versatility coverage on the mountain with the 82 underfoot. My carving, crud, and up to boot high pow skis are 78 underfoot and my crud, pow ski above boot is 98 underfoot. THe 78 underfoot is a 168 length and the 98 underfoot is 178 underfoot. I think you should consider this and take a good look at the Blackeye TI in the 167 length. I can almost guarantee you that you won't notice the length difference but will notice the improved stability difference. Heck if it costs a few bucks more, I think you'll get that much more enjoyment out of them and it's not like your buying skis every year...or are you? Thanks Gary. I don't think I will have a problem with a 167mm length and will look at some other all mountain/mid-fat options. I'll keep the 164mm Smoke Ti's unwrapped for now as the vendor has a 30 day"no hassle" return policy. Sounds great Jim...hope you'll be on snow soon showing those new skis who's the boss! Returned the Smoke Ti and got the 2011 Blackeye Ti in 167mm. I wanted to get to Mount Snow or Windham Mountain this week, but work has picked up again. Ski season probably over for me, but hope to get to an early start next season and will try to report back on my impressions of the Blackeye Ti. Hey Jim...nice get on the Blackeye T's.....great versatile width underfoot for those crud and spring snow days and I think you'll appreciate the longer length. Look forward to hearing your review of same.